What’s up with this tomato? We’re trying to grow tomatoes. We didn’t do too much research, just bought some seedlings and threw them in the ground and figured this year can be a “practice year.” Anything that does come to fruition will be a bonus. 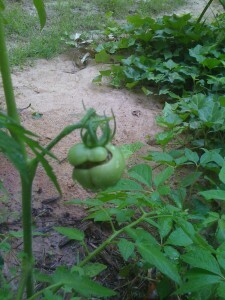 Still, I don’t know what to make of this mark on the tomato. Is it a fungus? An insect? Totally normal? I’ve done some lazy Googling, but haven’t found anything. 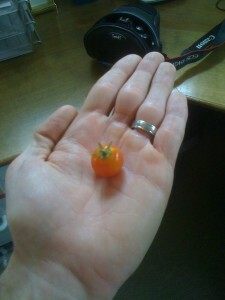 They’re not all traumatized though, here’s a picture of our first Cherry Tomato. It was good, but not amazing. Oh well… practice. This entry was posted on Sunday, June 6th, 2010 at 10:28 am and is filed under distractions, Healthy Stuff. You can follow any responses to this entry through the RSS 2.0 feed. Both comments and pings are currently closed. If I were you I would be less worried about the tomatoes and more worried about your freakishly deformed hand. It looks like you are in the early stages of a werewolf transformation. That’s a good looking hand if you ask me! Maybe the knuckles are a little big, and I did break that thumb once, but I never thought my hands were anything to be self-conscious about. I guess it’s never too late to get a new complex. I will give you the benefit of the doubt and assume that it’s an optical distortion caused by using a wide-angle lens up close, rather than you actually being a freakishly deformed werewolf. But whatever the cause, your fingers appear to be bending the wrong way at the middle joint. It’s weirding me out again just looking at it. The cherry tomato is pretty, though.